1. The paper stock you are using (thickness, stiffness, and whether glossy). 2. The number and type of pieces that go into the envelope (you need a feeder for each different type, e.g. letter, flyer and reply envelope). 3. Whether the number of sheets varies by envelope. For instance, customer 1 gets a 2 page invoice. Customer 2 gets a 3 page, etc. If so, you need the optional Bar Code or Optical Mark Recognition which puts the right set into the envelope. 4. The monthly volume (number of stuffed envelopes processed) Each model has a monthly maximum. 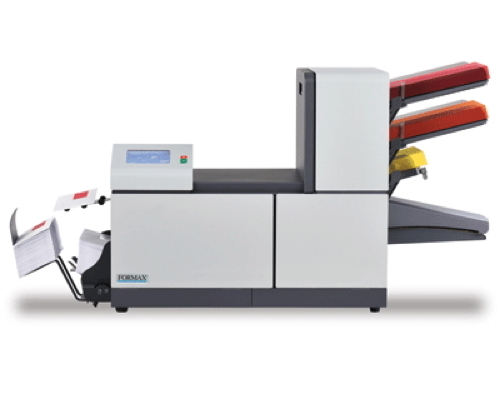 Our machines range from 5,000 to 200,000 maximum per month. All folder-inserters must use the type of envelope shown. It is generally a standard #10 commercial envelope with a single or double window. The flaps and seams must be on a diagonal, not straight. The flap is V shaped and has rounded corners as shown in the example. If reply envelopes are used, they should be #8 size with similar construction. 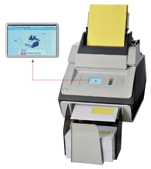 Some of the higher rated machines can accept 6.5" x 9.5" or 10" x 13" envelopes. Whatever the size, the flaps and seams must be shaped like this. If you need an envelope supplier, we can recommend one. Go to the chart below. First select the machine that will put the right number and type of pieces in the envelope and then compare the Max Envelopes/Month against your monthly volume. All of these are built to run up to the monthly volume shown but not beyond. Next, see if the options cover your needs. Once you have selected a machine, call us at 800-520-6008 to confirm your choice. There are many details, and we will need to test samples to make sure under any circumstances. Weight Up to 82 lbs. up to165 lbs. 165 lbs. 242 lbs. (4 station) Up to 308 lbs. Up to 715 lbs.